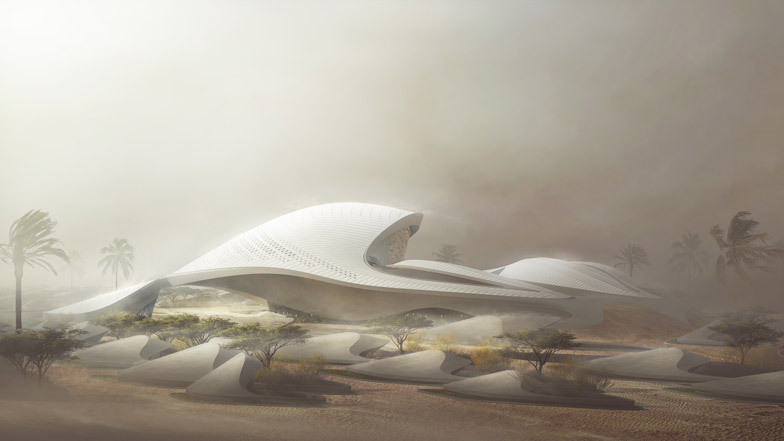 News: Zaha Hadid has designed a building shaped like a field of sand dunes to house the headquarters of Middle Eastern environmental company Bee'ah. The 7,000-square-metre building will be constructed in Sharjah, in the north of the United Arab Emirates, and will house the administrative and public activities of the company, which specialises in waste management. Entirely powered by renewable energy sources, the proposed building has been designed by Zaha Hadid Architects to resemble "a series of intersecting dunes" orientated to follow the direction of the prevailing Shamal winds. The two largest dune forms will house the management offices, visitor facilities and administration department. Where the forms overlap, a protected courtyard will offer a breakout space for staff. According to Bee'ah, this "oasis" will provide the building's interiors with "high quality daylight and views" whilst limiting the amount of glazing exposed to the harsh sun. The curving exterior walls will be clad in materials selected for their ability to reflect the sun's rays. Parts of this skin and the building's structure will have standard orthogonal dimensions, allowing them to be constructed from reclaimed materials sourced from local construction and demolition waste. A ventilation energy recovery system will reduce the need for mechanical cooling systems, while photovoltaic cells will be integrated in the surrounding landscape to provide the building with solar power. Once complete, the building will facilitate the company's education programme, working with schools to teach children about their role in the environment. It will operate alongside Bee'ah's waste management centre, which includes a material recovery facility, a construction waste recycling centre, a compost plant and a tyre recycling facility.